Back in November, we announced that we were developing a new version of the DadPad. Nearly seven months later – and very appropriately on Father’s Day – DadPad Neonatal was launched at Poole Hospital’s Neonatal Unit in Dorset. DadPad Neonatal was developed in partnership with Prof Minesh Khashu, Lead Neonatal Consultant at Poole Hospital and with the assistance of funding from the National Lottery Awards4All. It contains help, information, guidance and support for dads who find themselves on a neonatal unit. It also includes space to add notes and photos so that it can become a keepsake and journal for new dads. Some of the families whose babies had been admitted to the Neonatal Unit at Poole, including the dads and families who assisted Julian and Prof Khashu in developing the content, were invited along to help celebrate the launch of this new product. When a baby is born prematurely, both baby and mum may require medical attention and this can leave dads feeling helpless and isolated. We hope that the DadPad Neonatal will offer support, guidance and resources to help during what can be a very challenging time for families. 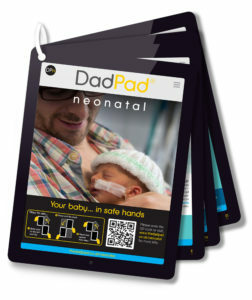 The Neonatal Unit at Poole will supply a copy of the DadPad Neonatal to every dad on the Unit in the next year. The other Unit to benefit from the initial roll-out of this new initiative will be the Royal Cornwall Hospital, Treliske, in Cornwall; their allocation will be arriving shortly. Samples of the DadPad Neonatal have also been sent to all 170+ neonatal units across the UK, and Julian hopes to see the resource become more widely available in the coming months. For further information on this product, including ordering copies for a neonatal unit, please contact Julian.